“Why is WinSxS so large?” has been asked by many Windows users. While this question has been discussed in blog posts, this topic goes into a little more details about the concepts behind the component store (specifically the WinSxS folder) and then provides links to topics that highlight ways to better manage the size of the WinSxS folder. The short answer is that the WinSxS folder isn’t as large as it may appear at first glance because size calculations can include Windows binaries located elsewhere which makes the WinSxS folder seem larger than it really is. Using Windows Update to install new component versions. This keeps systems secure and up-to-date. Enabling or disabling Windows features. Adding roles or features using Server Manager. Moving systems between different Windows Editions. The Windows Component Store was first introduced in Windows XP to support side by side assemblies. Beginning in Windows Vista, the component store was enhanced to track and service all of the components that make up the operating system. Those different operating system components track objects such as files, directories, registry keys, and services. Specific versions of components are then collected together into packages. Packages are used by Windows Update and DISM to update Windows. The components and packages used in a Windows installation are processed by the Windows Component Store. Determining the size of the Windows Component Store is complicated by the fact that many of the files are used by Windows from directories outside the Windows Component Store using a technique known as hard linking. In such cases, the files from a component version appear both inside and outside the Windows Component Store. By using hard linking Windows is able to appear to keep multiple copies of the same file without actually taking the added space for multiple copies. Files 1.txt and 2.txt are hard linked together and contain 1MB of data. Files 3.txt and 4.txt are also hard linked together and contain 2MB of data. In this example, you can see that the hard links enable multiple files to refer to the same set of data. Now what is the size of directory A? If you read the files in the directory A then the size of all the files that are read is the sum of each file size. In this example, that would be 4 MB. If you copy all the files from directory A to a new location, then the amount of data copied is the sum of all data hard linked from the files. In this example, that would be 3 MB. If you are trying to free up space by deleting the directory A, you will only see a reduction in size for the files that are hard linked only by directory A. In this example, this amounts to a savings of 1 MB. Back to the question of how much space is used by the Windows Component Store, and specifically the WinSxS folder. The third answer in the directory A example, most closely matches how much extra space is used. 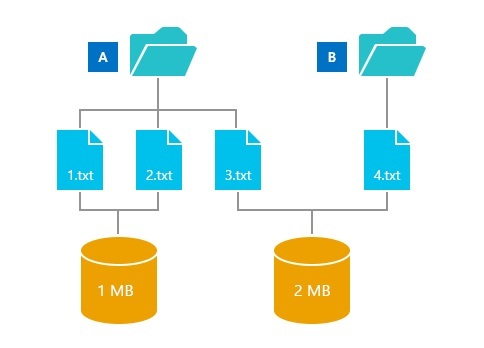 Files hard linked to the rest of the system are required for system operations, so they should not be counted, and files hard linked to multiple locations within the component store should only have the size stored on disk counted.